The freelance illustration station: Things I've created, things that I am creating and things that will be created when next the moon is full. Remember the Teenage Mutant Ninja Turtles? Well, let's face it, we're not allowed to forget those green bastards. 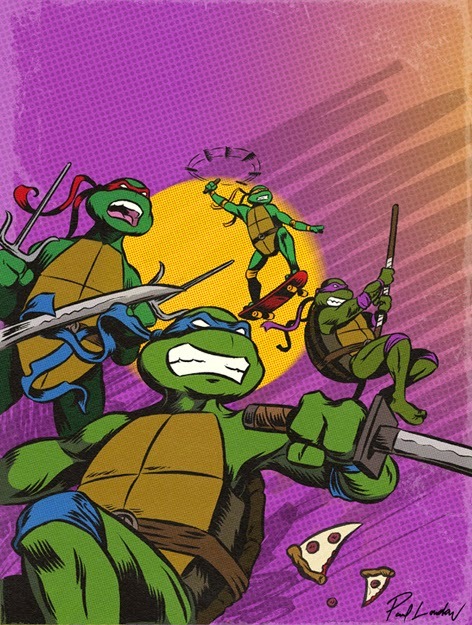 Except that over here in the UK, they were called "Hero" Turtles until some time around the mid 90's. ...That small fact, we UK residents would be allowed to forget, were it not for some man-child without a proper job reminding you. 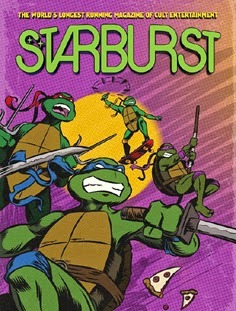 Anyway, last summer I had the joyous task of creating the collector's cover for Starburst Magazine issue 403 and it turned out to be Turtles themed. I wanted it to look like the original comics, with the all white eyes and yet acknowledge the cartoon with the blue, orange, red and purple of Leonardo, Michelangelo, Raphael and Donatello respectively. ..."Transformed from the norm by the nuclear goop" as the rap goes. Also, the scribbles remind me of a child going over his older brother's comic with a felt tip. Marty get to the time Machine! Microsoft "Cortana" (not a Ford Cortina). I am a freelance illustrator from Manchester in the UK. Paul Loudon. Awesome Inc. theme. Powered by Blogger.